Our bach is fun, funky and relaxing to be in. Bi-folding doors open onto a good sized deck creating lovely indoor/outdoor flow. The large barbeque and outdoor table (on wheels) and chairs can easily be set up on the covered deck or private grassed area as desired. From 2015 the bach is also home to Art Break Waihi taking bookings throughout the year. Although it offers room for one or two families, couples will enjoy the bach's attention to detail (a continuing work in progress) and its ability to comfortably sleep three couples who can enjoy their own privacy. A second toilet and fabulous outdoor shower can be accessed from the outside - handy for those sleeping in the beach hut, coming off the beach or just in nearby rooms. The split king bed in the blue room can be zipped together or serve as 2 single beds as preferred. All the beds are comfortable and most are new with good quality bedding. Three of the rooms have ranch sliders opening out onto the grassed area and louvres allowing both independent access when the place is unlocked and plenty of ventilation on those hot summer days and nights. Offering both sun and shade the bach is nestled between pohutakawa trees and pines in a quiet cul de sac and is very private. Having no TV ensures games are played, books are read...There are many games available as well as 'beach toys' and essentials (see separate photo), 3 push bikes and 2 sit-on kayaks. Despite there being no microwave or dishwasher, the kitchen is well equipped for the culinary-inclined. The 'hi-fi' unit is a Tivoli radio with speaker for an iPod/cell phone with bluetooth. Waihi Beach is a gem for its beauty, its walks, surf and trendy boutique shops, cafes and eateries. the gateway to the Hauraki rail trail and the Karangahake Gorge where you can take a train ride, enjoy the walks and swimming holes or discover the out of the way art and craft outlets. Athenree hot pools are 5 minutes away by car or a paddle across the harbour. Tauranga is 40 minutes away by car. Unsuitable for parties as is in a quiet cul de sac. Unsafe for toddlers or little children as property is not fully fenced. Be mindful there is no TV, no dishwasher or microwave. Extras: Cleaning (Required, NZ$50.00 per stay); NOTE: Under Kiwi bach tradition you are expected to: Bring your own linen. (towels/sheets/tea towels)and so this is not included in the cost. Should there be a problem with this, please contact the owner to see if linen can be supplied for an extra cost. I'm living and working in Auckland with my husband, Stuart and have also been running Artbreak Waihi with my business partner at our bach for the past three years. Stuart and I designed the bach together and our family have enjoyed holidays and frequent weekends there also. I come from the country (originally inland Hawkes Bay and then Ngongotaha) and my family live around these parts also so its a great base to get together. 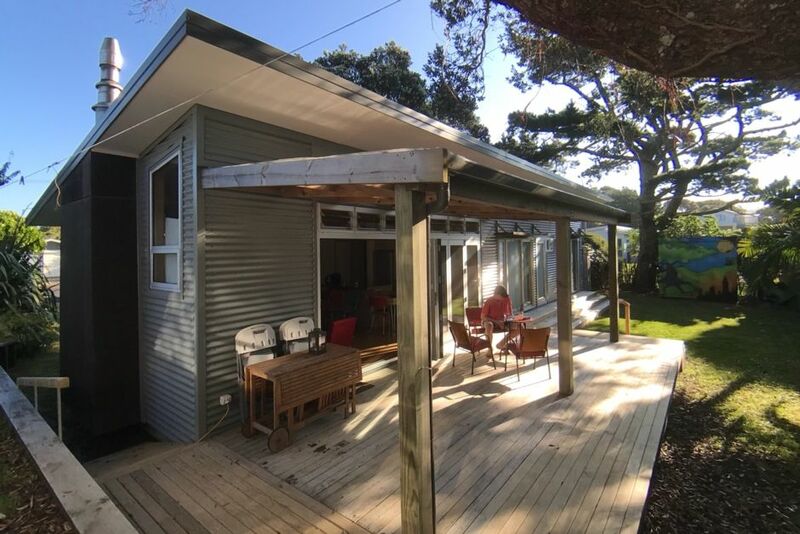 Both Stuart and I fell in love with the property because of the mature trees (Pohutakawas and Pines) and its proximity to the beach and village. For our budget it ticked all the boxes and the perfect place to build our modern easy-care bach. Built Xmas 2010 our bach is contemporary, fresh and well appointed. New outdoor shower is a hit! shower, outdoor shower, private but outdoors. Hot and cold water. toilet, accessed from the deck. 3 minute walk to Waihi Beach. Our bach is a 12 minute walk (no hills) to the local village which boasts unique boutique shops and cafes along with the local grocer, hardware, surf shop and pharmacy. Fire box heats the whole house once it has been going for a while. Alternatively or as well as this, there is a black fin heater stored in hallway cupboard. Not able to be used in the Beach Hut. Top loader in hall cupboard on same side as bathroom. Mini rad fire-box with wood available in living area. Fire-guard is stored at the end of the bed in the beach hut should young children be staying. Parking in front of the house for 3 cars. Also on verge. Kitchen, dining and living area all in one opens onto the deck on the north side of the house. Full height fisher and peykel fridge with freezer compartment. Basic items available for guests. Please replace if run out of these. Very well equipped with dishes, utensils and kitchenware as well as baking and cook ware. Equipped with oven and fridge. No dishwasher or microwave. Very well equipped with cooking, baking, dining dishes and utensils as well as tea towels and dish-cloths. The dining table opens to fit 6 and a cosy 8 repositioned to the middle of room. If more people, use tressle table packed under the bench -can be used outdoors. Second tressle table stored in shed. There is a little speaker and radio with blue tooth and connection for an ipod. Novels, magazines to browse through or read whilst there. If marked with a sticker please feel free to take/swap. Board games, cards, jigsaws + board, stored in the hall cupboard (hc) /under couch to work on. Tennis racquets, balls, boules, table tennis set in hc, swing ball set in o/s cupboard. bucket and spade, little cars. Flat grassed lawn on northern side. Can put outdoor table there also if want to enjoy meal out on the grass. Grassed area in front of the house and on the road-side for parking. 2 sit -on kayaks available. Key to padlock in kitchen drawer. Life jackets in bike shed. Check the tides and safety info in the Beach Book before venturing out in the estuary. bikes (incl 2 with generous seats, 3 speed). Check tyres and brakes before use to ensure your safety. We cannot check them after each visit/use. Tyre pumps, helmets, bike lock, basket available. Large deck on northern side of the living area under the Pohutakawa tree. Accommodates tressle table and chairs/ bbq/ coffee table setting, hammock and hammock chair (in hall cupboard). Boogie boards in outside cupboard. Beach chairs and beach umbrella and shade tent there also. Use same key as for the bach to unlock/lock it. Tennis raquets and balls in hall cupboard. Tennis courts at Northern end of beach and in Bowentown. Check Beach Book at bach. As well as a place for families, it is a lovely place for a romantic time away. The place has been designed to accommodate a large group but to retain the bachy feel to it. The tuis love the tall trees on the property. You will also hear the grey warbler now and then. Loved the funky retro furniture and enjoyed playing the board games and puzzles. We had everything we needed there and the beach just across the road! The indoor outdoor living was perfect for relaxing in the evening and enjoying the summer breeze. It is heart warming to host families/people like yourselves who really enjoy what our place offers and leaves it so nice for the cleaners. We'd love to host again anytime. Cheers. The bach comfortably accommodates two families and there are so many neat / thoughtful features to make you feel relaxed and at home. The older kids in our group loved sleeping in the beach hut and we all enjoyed the outdoor shower. Excellent selection of magazines and games. Thank you Naomi for sharing your wonderful home ! We thoroughly enjoyed staying in this holiday home. It was very stylishly beachy decorated. Everything was there. Nice atmosphere. And very quiet !! : we slept way more hours than normally. Loved it and would return if there is an opportunity. Thanks for your lovely review and you are very welcome to return anytime. This Bach was fabulous for our mid winter get away. No tv was a shock to our teenagers but there was a lot of family time by the wood burner and lots of book reading. Great set up and loved the artworks. So glad you enjoyed your stay as much as we do. We love going there in the winter. Thankyou for leaving the place in a good state for our cleaners. A cosy, comfortable and spacious retreat. Loved this place!!! I highly recommend it. Three bedrooms inside the house sleeps 2 in each and an outside cabin which contained a double bedroom and 2 single bedroom. The house was efficiently warmed by a wood fire burner which had stacks of firewood on hand and already chopped up and the cabin beds had electric blankets and oil heater to keep the Winter chills at bay. The kitchen was fully equipped and towels, pillow slips and blankets were supplied free of charge. Bed linen could be hired at an extra cost.The beach is just across the road and the main township is a 10 minute walk. We all loved this house and are already contemplating on staying there again next year. Thank you Naomi. Thanks so much Tom and family. We'd be more than happy to have you back. You left the place immaculate! Above and beyond. In a nut-shell, here is a list of ideas. If interested, you can check these out further through our links below. Shopping at the beach, Waihi or Katikati. There are many second- hand shops. Waihi Beach is small but punches above its weight. It has unique shops for gifts, womens clothing and accessories. a great hardware store including gifts for the family, an excellent pharmacy, chocolaterie, its very own French shop, delicatessan and cafes to choose from. We also provide info in our bach.